to float down the sky on? we'll draw many countries and tracks. or you'll fly sky high with the land mines. and together we will flee. cannot be measured in years. illusion gleams in pans and mugs. I must tell you that it has melted with the last snow in the garden. Many, many stones have made our feet so sore. It is a beautiful time when the date stone sprouts! Each one that falls has wings. and your bud sinks onto my seal. We must go to sleep, darling, the game is over. On tip-toes. The white shirts swell. when we exchange our breath. 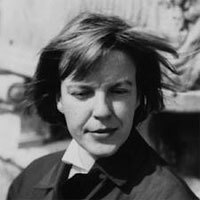 Ingeborg Bachmann was born in Carinthia and studied philosophy, psychology and German at the Universities of Innsbruck, Linz and Vienna from 1945-50, when she earned a doctorate in philosophy. In 1951, she started working as an editor at an Austrian radio station, where she wrote her first radio play. In 1952 she managed her lyrical breakthrough with a reading at the "Gruppe 47". From 1953 she moved between Vienna, Zurich and Rome, where she settled for permanent in 1963. With publishing her poetry collection The Respite and The Invocation of the Great Bear, she put a lot of effort in criticising the post-war society, recalling the old order. In 1961 her partly autobiographic collection The Thirtieth Year got published. In 1971 she wrote her first novel Malina, which was a starting point of subjecting female matters and part of her project Cycle of Ways of Dying. However, her novels Franza's Case and Requiem for Fanny Goldmann where published unfinished. In 1973 Ingeborg Bachmann died, because she fell asleep smoking in her bed. She won many literature prizes and is highly acclaimed in female studies.